Info U.S. Rep. Paul Ryan is in his seventh term in Congress representing Wisconsin’s First Congressional District. He is Chairman of the House Budget Committee, where he has worked tirelessly leading the effort to rein in federal spending and increase accountability to taxpayers. He also serves on the House Ways and Means Committee, where he has focused on simplifying the tax code and making health care more affordable and accessible. In January 2010, Ryan gained attention nationwide after unveiling his “Roadmap for America’s Future,” a proposal to eliminate the federal deficit, reform the tax code, and preserve entitlements for future generations. Representative Ryan was born in Janesville, Wisconsin on January 29, 1970. A fifth-generation Wisconsin native, Ryan was the youngest of four children born to Paul Ryan Sr., who worked as an attorney, and Betty, a stay-at-home mom. In April 2000, Ryan proposed to Janna Little, a native Oklahoman, at one of his favorite fishing spots, Big St. Germain Lake in Wisconsin. Later that year, the two were married in Oklahoma City. The Ryans reside in Janesville with their three children, Liza, Charlie and Sam. The family are parishioners at St. John Vianney Catholic Church. Upon entering Congress in January of 1999, Ryan was the youngest member of the freshmen class at the age of 28. Prior to running for congress, Ryan served as an aide to Republican Senators Robert Kasten Jr. and Sam Brownback, former U.S. Rep. and Vice Presidential Candidate Jack Kemp, and as a speechwriter for Education Secretary William Bennett. 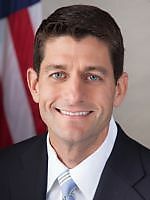 Ryan is a graduate of Joseph A. Craig High School in Janesville and earned degrees in economics and political science from Miami University in Ohio. He is an avid outdoorsman and is a member of his local archery association, the Janesville Bowmen. In August 2012 former Governor Mitt Romney announced his selection of Paul Ryan for the GOP Vice Presidential nomination.